Following the launch of the OnePlus 6, Samsung is offering lucrative discounts on a couple of its smartphones in India. The South Korean consumer electronics giant, already displaced by Xiaomi as India’s biggest smartphone vendor, is also facing a stiff challenge from OnePlus in the premium segment, where the OnePlus 5T has been the best-selling device over the past few months. As part of its strategy to retain customers, Samsung has slashed the prices of a number of its smartphones, including its 2017 flagship, the Galaxy S8. The device is now available at a massive discount over is listed prices, thanks to a Rs. 8,000 cashback offer. Do note that the offer is only available on Paytm Mall, where it can be bought for an effective price of just Rs. 37,990 after the cashback. The phone is listed at Rs. 45,990. 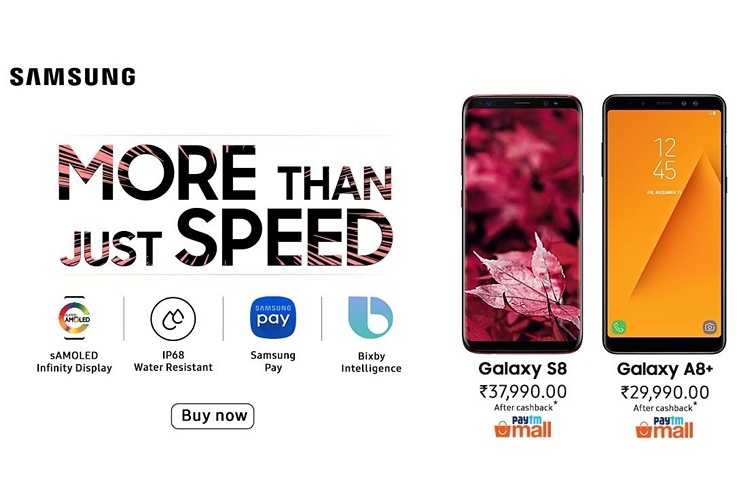 As can be seen from Samsung India’s official tweet, the company is also offering a cashback on its mid-ranged Galaxy A8+ handset, although, the rebate is a little lower on this device. It can be bought with a Rs. 5,000 cashback on Paytm Mall, bringing the its price down to Rs. 29,990. The device is currently listed at Rs 32,490 on the e-commerce portal. Samsung is clearly taking an aggresive stance in its effort to fend off competition from its Chinese rivals and prevent further erosion of its market-share in the country. It will be interesting to see if the strategy will be successful, but after seeing its market-share completely decimated in China over the past few years, the South Korean giant can ill-afford a repeat of a similar debacle in India.